Byzantine Hippodrome : The center for entertainment, amusement and sports in the city during the Roman and Byzantine Empires. The Egyptian Obelisk , the Serpentine Coloumn and the German fountain of Willhelm II are visited. Blue Mosque : The Sultan Ahmed Mosque ,one of the most respected masterpieces of the Islamic world. 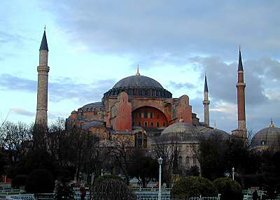 Famous with its blue ceramic tiles which gives the mosque the well known name;"Blue Mosque" with its six minarets. Topkapi Palace : The former Imperial residence of Ottoman Sultans , one of the oldest and the largest remaining palaces in the world. Today it is used as a museum to exhibit works of Art and many priceless artifacts. Grand Bazaar(Kapali Carsi): The oldest and the largest covered market place in the world with more than 3000 shops with its rich collection of handmade carpets, jewellery, leather and souvenirs.